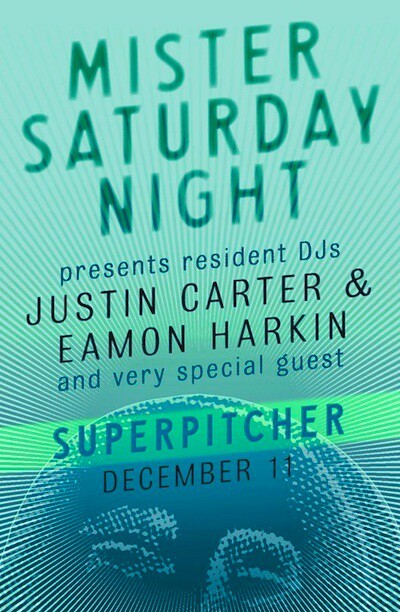 After taking the whole night for themselves a couple weeks ago, Eamon Harkin and Justin Carter are passing off deck time to Kompakt maestro Superpitcher this Saturday. Hearing him on the recently installed soundsystem in our new home is going to be an experience to say the least – we suggest standing directly under the disco ball for optimal body moving experience. Everything else is just like you want it to be: plenty of space for dancing, free beers for the first hour of the party, couches to relax and chat on and an outdoor space with a gazebo for fresh air. Is it some kind of voodoo? No, it’s just Mister Saturday Night. RSVP to mister [at] mistersaturdaynight [dot] com for location details.